Find Ivy Balanced Fund (IBNAX) review. This asset allocation mutual fund invests in stocks, bonds, and short term instruments. Also find the latest investment ads by Ivy Funds. Ivy Funds provide variety of mutual funds. They offer asset allocation funds, domestic stock funds, global stock funds, sector stock funds, taxable bond funds, money market fund, and municipal bond funds. Some of these funds are top mutual funds. They also sponsor Sporting Kansas City in MLS soccer. 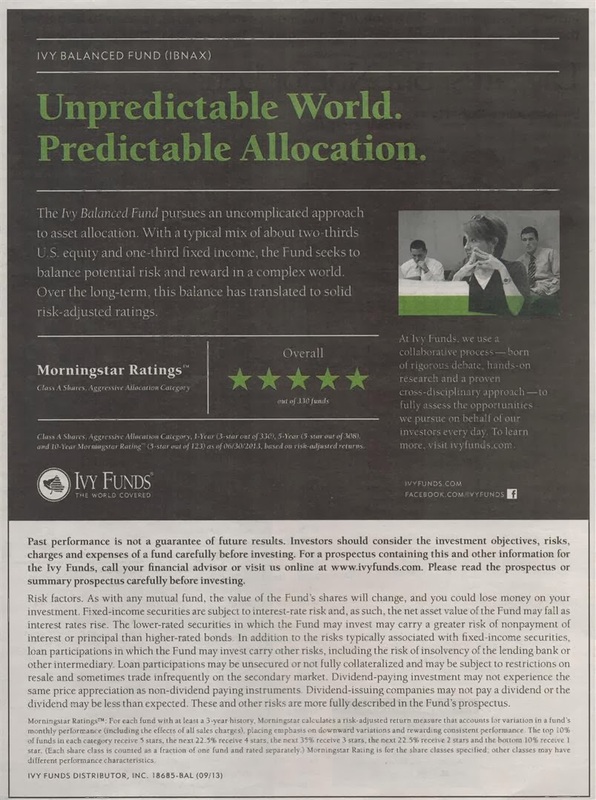 Recently, you can find an ad by Ivy Funds about Ivy Balanced Fund (IBNAX). The catch words include “Unpredictable World, Predictable Allocation.” Should you invest in this top mutual fund? Whether it is in your brokerage account, retirement account (IRA), or 401k plan, you need to find the fund details. Find the fund review below. The Ivy Balanced Fund pursues an uncomplicated approach to asset allocation. With a typical mix of about two-thirds U.S. equity and one-third fixed income, the Fund seeks to balance potential risk and reward in a complex world. Over the long term, this balance has translated to solid risk-adjusted ratings. Class A Shares, Aggressive Allocation Category. 1-Year (3-stars out of 330), 5-Year (5-star out of 308), and 10-Year Morningstar Rating™ (5-star out of 123) as of 06/30/2013, based on risk-adjusted returns. At Ivy Funds, we use a collaborative process – born of rigorous debate, hands-on research and a proven cross-disciplinary approach – to fully assess the opportunities we pursue on behalf of our investors every day. To learn more, visit ivyfunds.com. Managed by Cynthia Prince-Fox since 2003, this Ivy Balanced Fund utilizes its assets to buy equities and debts. This asset allocation fund was introduced to public in 1987. It seeks to provide total return through a combination of capital appreciation and current income. It has 3-stars rating from Morningstar. The total net assets are $1.5 billion. This balanced mutual fund has recorded 20 years of positive return with the best 1-year total return in 1998 with 22.60%. The worst 1-year total return within 5 years of negative return was -19.47% in 2008. It uses the Large Growth investment style. The YTD return is 20.03%. The fund is currently on the 28th rank among its peers. The top 5 equity holdings as of October 2013 are Limited Brands, Inc (2.3%), Anheuser-Busch InBev SA, ADR (2.2%), PNC Financial Services Group, Inc (1.7%), Boeing Company (1.7%) and Applied Materials Inc (1.7%). The top sector allocation is Consumer Discretionary (21.77%). Invest in no sales load fund such as Class I, Class R, or Class Y. With 5.75% sales load, class A fund is too expensive for long term investment. Since the ad being advertised, Morningstar has adjusted its rating from 5 stars to 3 stars.